About Discount Carrier Bags - buy carrier bags at discount prices or design your own - get a quote in 60 seconds! Discount Carrier Bags is a specialist website from Polybags Ltd, the UK's number one manufacturer of polythene packaging, to showcase their printed carrier bags service. 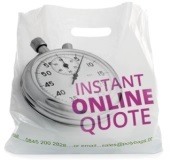 Get a quote in 60 seconds on carrier bags personalised with your company logo or design or, if you don't need your bags quite so bespoke, then take a look at Polybags' massive range of carriers available off-the-shelf at discount prices. A huge range of carrier bags in all shapes and sizes, styles and colours. From cheap and cheerful vest carriers to premium clip close handle carriers and biodegradable carriers - whatever type of carrier you need, Polybags has it covered! Polybags' range of polythene mailing bags provides the perfect alternative to regular envelopes. Lightweight but strong and waterproof, poly mailers are simple to use with an integral sealing strip. Secure, heavy duty and Mailtuf options are available, or you can personalise your own printed mailers to take your deliveries to the next level. Bubble wrap and bubble bags allow you to place delicate items in the post or storage with peace of mind. Available in a range of sizes, this air-cushioned bubble film provides the perfect protection for valuable items of any shape or size. Keep an eye out for the environment whilst getting the job done with Polybags' range of eco-friendly products, made in line with the latest research findings. From bin liners to carrier bags, these products will boost your green credentials. Dispose of waste from home or office, garden or workplace, with Polybags' fantastic range of waste sacks. Includes a range of specialist sacks to help deal with clinical waste, asbestos, heavy duty rubble and more, you'll really clean up with these bags! Protect contents whilst keeping them in handy bags for storage and retrieval with Polybags' range of grip and zip seal bags. These resealable bags keep contents safely protected from moisture, dust or other contaminants and provide a great storage solution for a huge range of small to medium-sized items. This range of classic plain polythene bags caters for a huge variety of uses, from covering pieces of furniture while moving house, or protecting that important family heirloom in storage. Available in a range of thicknesses and sizes. Popular in the building trade, polythene sheeting is a great way to protect a wide surface area from paint, plaster or building waste. Available in a range of widths and thicknesses, polythene tubing is perfect for wrapping items of odd shapes and sizes. 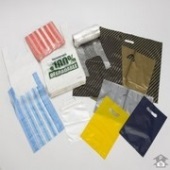 Polybags stocks a range of polythene and paper bags for use with food. Perfect for maintaining hygiene while packing, preparing or transporting food, these products are popular with shops, take aways, delicatessens and market traders. Using vacuum bags and sealers can extend the shelf-life of your food by up to five times, making them a firm favourite within the catering industry. Suitable for the storage of cooked, dried and fresh food stuffs, including fish, meat and vegetables. This range of protective packaging caters for any business who need to clean, handle or transport clothes. Available in clear or pre-printed form, this range of garment and linen covers are available loose or on the roll. 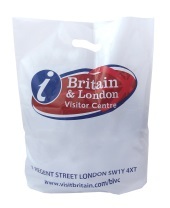 If you are a manufacturer or retailer looking to give some extra sparkle to your products, then polypropylene display bags are just what you need. These crystal-clear bags are stronger, clearer and cheaper than cellophane and are guaranteed to add a touch of sparkle to your products and retail displays. Shrink wrap is a polythene film that shrinks or tightens around the packaging contents when heat is applied. Polybags provide an excellent range of shrink film on the roll and pallet covers - used to secure goods on pallets - along with shrink kits and shrink guns used to shrink the film to secure the products as required.